Base game includes all DLC released for the Xbox One version. The in-game micro-transactions used in the Xbox One version have been removed. Ryse supports several CVAR values which can be inserted into the system.cfg file. 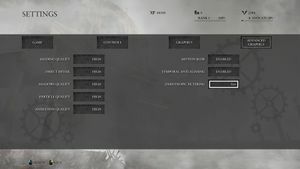 Use Flawless Widescreen to fix HUD issues. Hor+ gameplay. Menus appear stretched. Use this Cheat Engine table. Negative values increase third person FOV, positive values increase first person FOV. SSAA 1.5x1.5 to 2x2 and Temporal Anti-Aliasing. SMAA always on. No frame rate cap; a 30 FPS cap option is included. Keys cannot be remapped. 2 WASD configurations and 1 arrow keys configuration available. 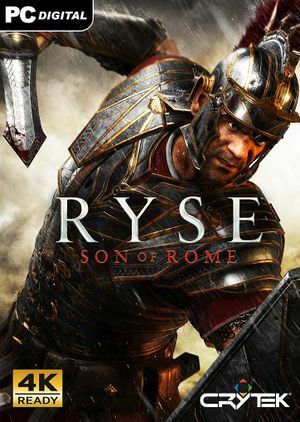 See Helix Mod: Ryse - Son of Rome. List of known issues and fixes at Crytek website. Open system.cfg in a text editor. The following steps may fix stuttering on some systems due to the way VSYNC is handled in the game. First apply the Low CPU performance fix. 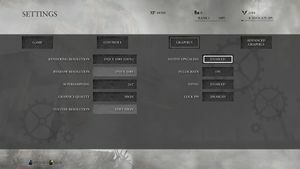 Go to Nvidia control panel (or AMD equivalent) and enable both Triple Buffering and VSYNC for Ryse in the "Manage 3D Settings" tab and press Apply. ↑ 2.0 2.1 File/folder structure within this directory reflects the path(s) listed for Windows and/or Steam game data (use Wine regedit to access Windows registry paths). Games with Steam Cloud support may store data in ~/.steam/steam/userdata/<user-id>/302510/ in addition to or instead of this directory. The app ID (302510) may differ in some cases. Treat backslashes as forward slashes. See the glossary page for details. This page was last edited on 16 April 2019, at 02:05.